Secure packages with maximum holding power and durability, close cartons other than traditional RSCs, tab the end lap of metal coils, stabilize pallets, and reinforce large cartons or bulk containers. 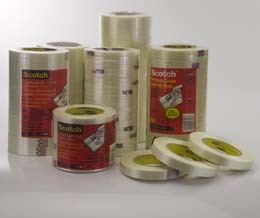 Packaging professionals have a lot to like with Scotch® High Performance Filament Tapes. Tab the end lap of metal coils, stabilize pallets, and reinforce large cartons or bulk containers. Natural rubber, synthetic rubber, modified synthetic rubber and clean removal. 3M 8916V 6.0 170 lb. Polypropylene backing reinforced with glass yarn filaments with a synthetic rubber resin adhesive. 3M 894 6.0 mil 300 lb. Performance grade UV-resistant tape reinforced with continuous glass-yarn filaments. 3M 8988 6.9 mil 380 lb. Clear polypropylene backing reinforced with glass yarn filaments.